The International Transport Forum (ITF) at the Organisation for Economic Co-operation and Development (OECD) is an intergovernmental organisation with 54 member countries. It acts as a strategic think tank for transport policy and organises an Annual Summit of ministers. The goal of ITF/OECD is to help shape the transport policy agenda on a global level, and ensure that it contributes to economic growth, environmental protection, social inclusion and the preservation of human life and well-being. This column outlines a new ITF/OECD research project on the impact of mega-ships for port-cities. Main questions in this project relate to impacts on maritime transport, ports and port hinterlands, as well as effective public policy responses to ever-larger ships. 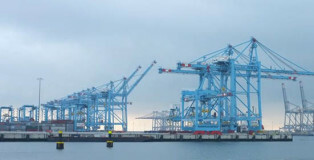 The ITF/OECD is currently selecting ports to participate in the project. At the Summit of the ITF/OECD, ministers from 54 member countries engage in focused debates with decision-makers from business, civil society leaders and top academics. The International Transport Forum’s 2015 Summit focusing on the theme “Transport, Trade and Tourism” will take place in Leipzig, Germany from 27-29 May 2015.